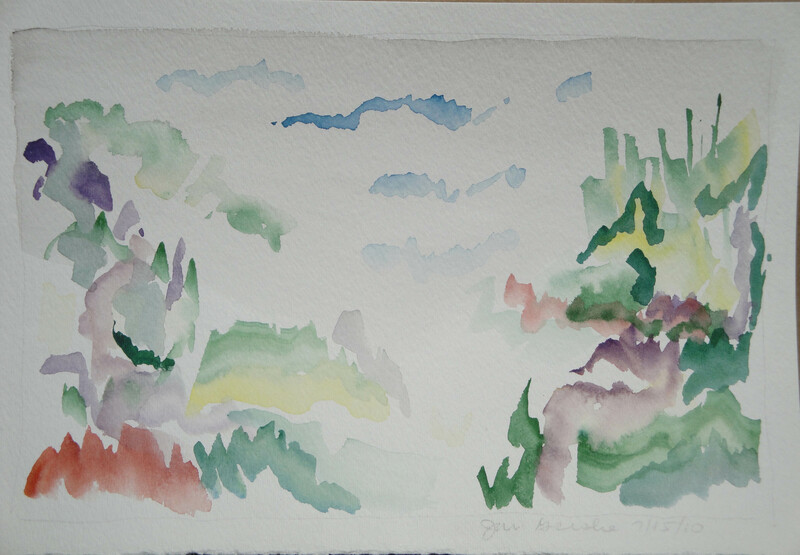 “I want something to look at,” she said, “and I want to spend time painting it.” She wanted something close to Joseph Raffael’s watercolors, (>) though certainly not as huge. 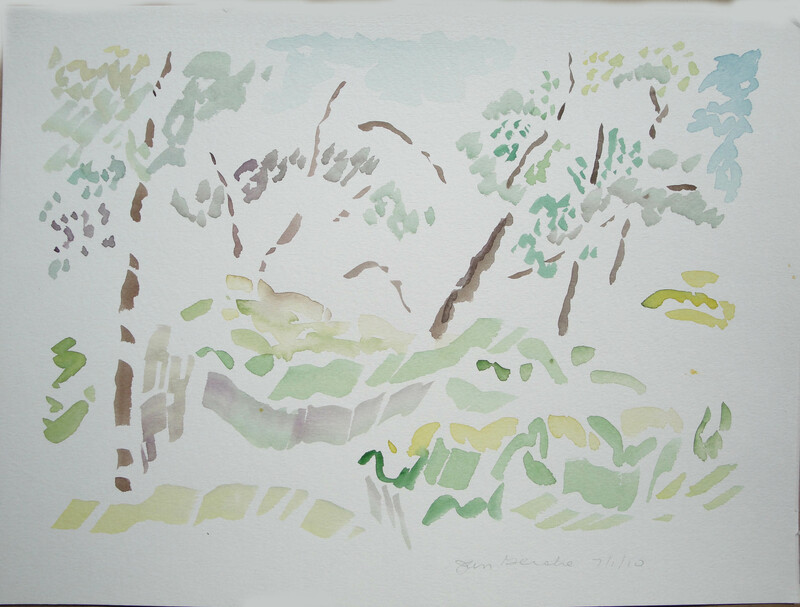 She came to my plein air landscape class with the expectation of spending a couple of hours working on one watercolor, layering and slowly developing a dense surface. Then she suddenly did this. 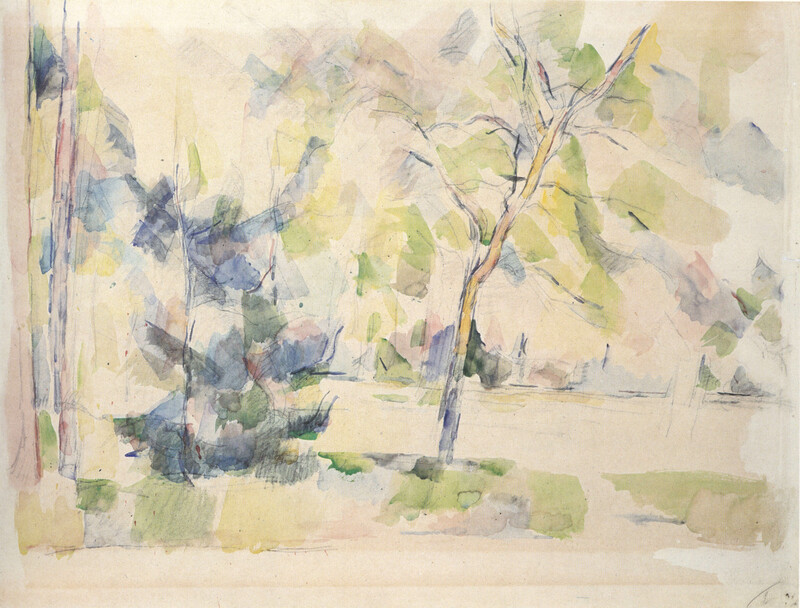 (<) I had suggested that she look at Cézanne (below), a master of luminous, transparent color, whose watercolors print very nicely and are available in books. The Cézannes were lovely, she though, but there was “not much to look at” and it’s not what she wanted to do. All that white. She wanted the surface more worked, denser, darker, more complex. And she wanted to spend more time on one painting. 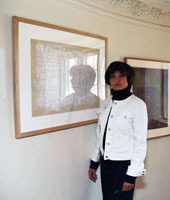 Instead, suddenly, she started producing four or five paintings in a three-hour class. She didn’t like these paintings at first; they came too easily to her. She had expected to WORK. But I think otherwise. 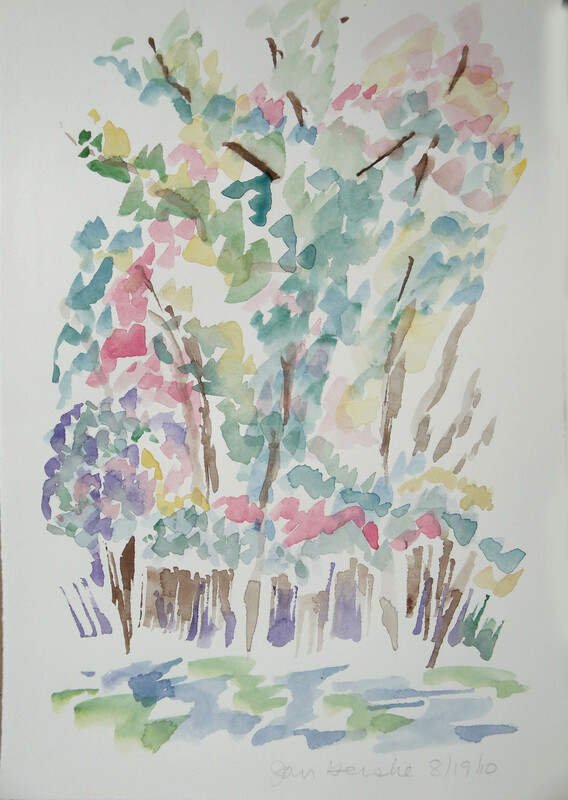 I think producing such watercolors takes tremendous concentration and a rapport with this unforgiving medium that may have suited her sensibility but which she only now allowed to play out. 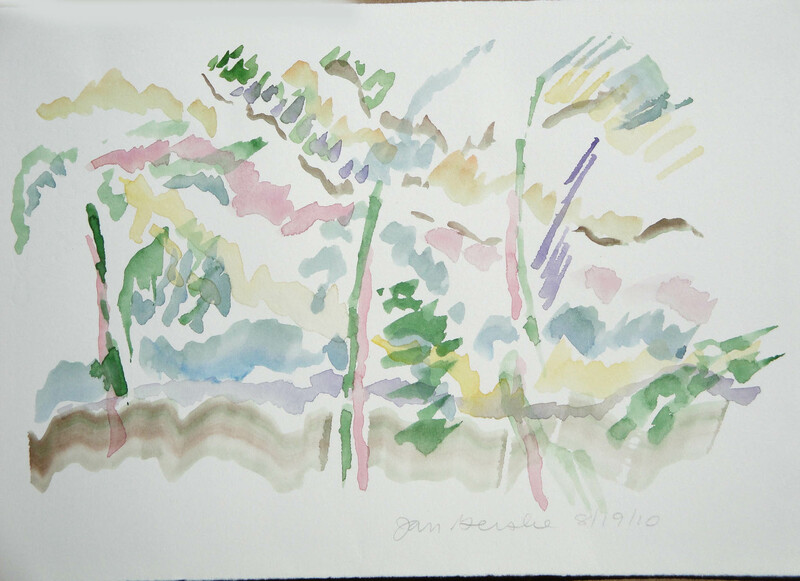 At the end of our ten-week course Janet told me that she had previously studied with a teacher who advised her students to cover up the white of the paper: just put a uniform wash over the whole paper before you start painting. How perverse, I thought, don’t do that! It’s the white of the paper that makes the color luminous. 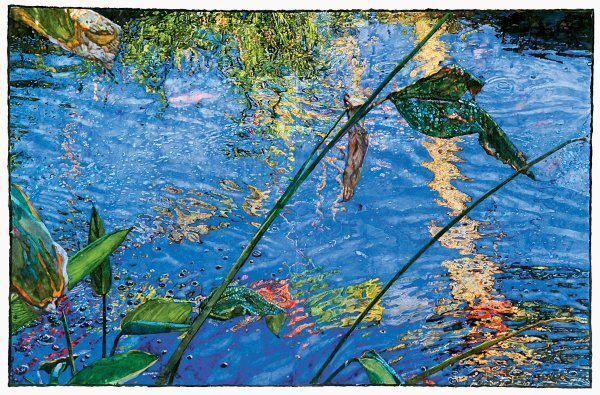 Why would you want to start with a murky surface and condemn your lovely watercolors to muddiness right off the brush. On the last day of our class, Janet confessed, working with the white paper as a key element in the whole process made more sense. The white of the paper becomes an element in itself, not just background that needs to be filled. Using the white as an element takes skill, sensitivity and a concentration that constantly reads the whole surface and how everything on that surface relates to everything else. This is not easy. This rapport comes to most people only after countless hours spent in patient experiments involving little blotches of color into which other blotches of color are bled. Hours, months, years. That someone would have such a natural feeling for this medium strikes me as very rare. I, for one, find myself absorbed in these watercolors. The white in them has a presence and projects a power that I find quite moving. The words “Beginner’s Mind” are part of a Shunrui Suzuki’s little book Zen Mind, Beginners Mind. Though we did not talk about this book at all, I feel it’s appropriate to comment on it since the student used the expression. The “Beginner’s Mind” is not at all stupid or crude. The ability to be in a state of “beginning” comes after much work of staring down the mind’s constant commentator. In that state the mind is able to see clearly. To see clearly is to see the “whole picture” including all the white bits that appear to be blank but are anything but. Many viewers, looking at all that white space in the watercolors, are asking, “but how do you know it’s finished?” This question deserves a post of its own. Later.